When I was a kid I hated blue cheese. Nothing could convince me to eat it. And whenever my mom made something with blue cheese in it, I resisted it with all my stubborn might. But this story has a good ending. 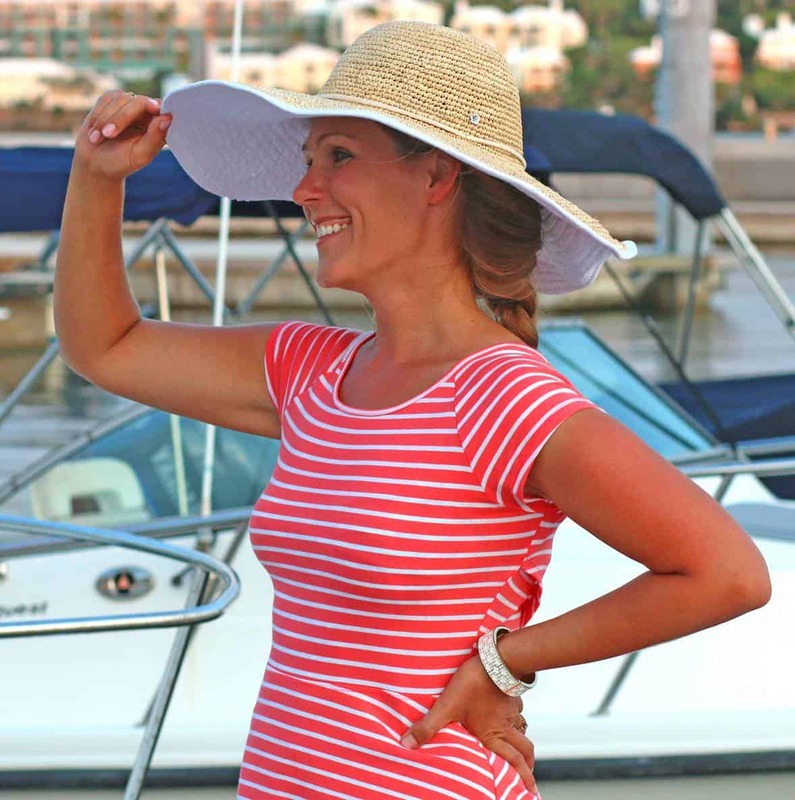 Once I hit adulthood I finally came to my senses and fell completely in love with it! Now it’s almost a hobby of mine to sample all the blue cheeses I can get my hands on, both domestic and international varieties. 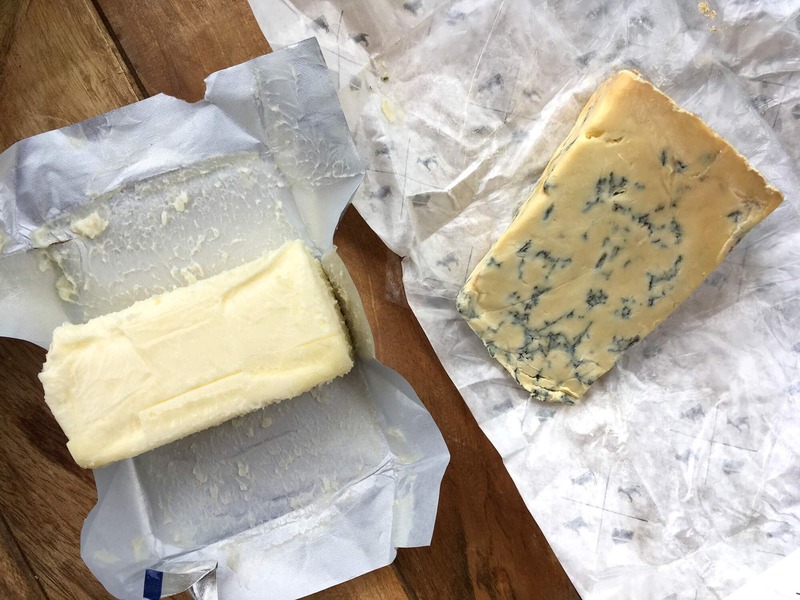 I’ve had at least 20 different kinds of blue cheese from around the world and I can regularly be found browsing through the specialty cheese section, eager to try a new one. I love using blue cheese in a variety of ways, including just nibbling on it or featuring it as part of a cheese board for entertaining. 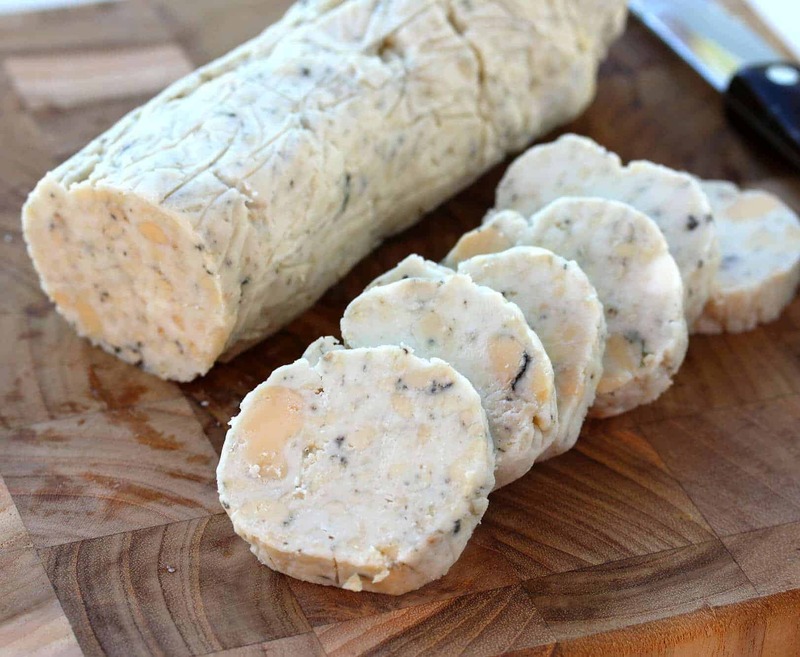 Blue cheese is also amazing in cream sauces, with pasta dishes, on pizza, salads and about a thousand other ways. Oh, and lets not forget using it for dunking bread sticks and pretzels! Something I also like to do with it is incorporate it into a blue cheese compound butter. 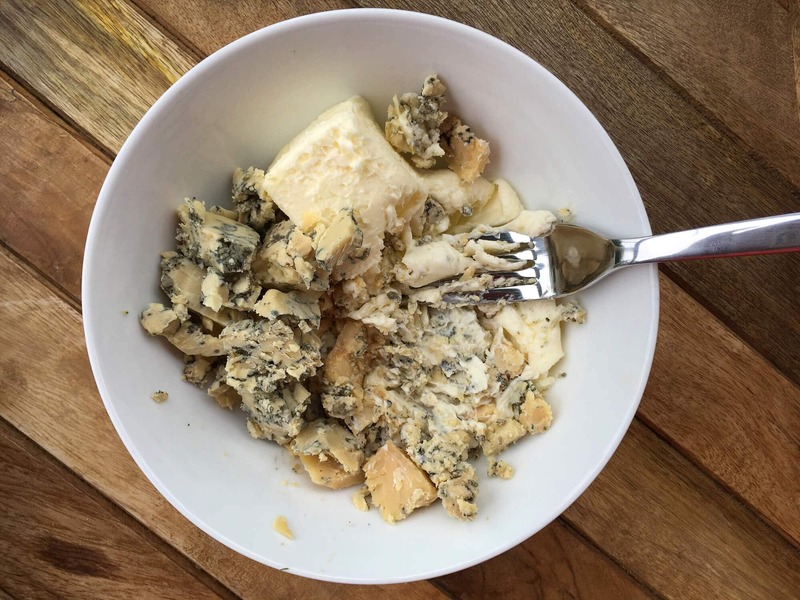 Besides tasting out of this world delicious, it’s also a great way to lengthen the life of the blue cheese because once you mix it with the butter you can freeze it. 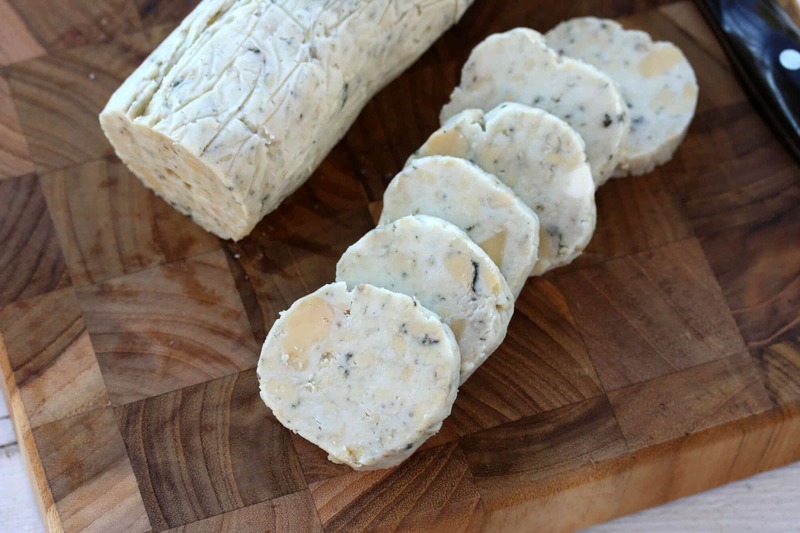 When I see specialty blue cheeses on clearance when they’re approaching their expiration date, I’ll stock up on them and, after eating a generous portion of them, I’ll make blue cheese butter and freeze the logs so I have them on hand as needed. It’s absolutely divine melted on grilled corn or steamed veggies and added to mashed potatoes! And melted over a grilled steak…it’s pure heaven! You just need two things: Butter and blue cheese. How much blue cheese you use per stick of butter is personal preference. I usually gauge it based on the strength of the blue cheese. The milder it is, the more of it you’ll need to provide a good amount of flavor; the stronger it is, the less you’ll need. 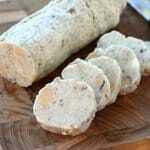 I love a strong blue cheese though so I’ll use a good amount of even the strongest varieties like Stilton. Optionally, you can add some fresh herbs to it like parsley, thyme, rosemary or chives or add some finely minced garlic. The butter needs to be at room temperature so it’s soft. Combine it in a bowl with the blue cheese, which has also been allowed to sit at room temperature for at least 30 minutes. Mash the two together with a fork. You don’t want to puree it because keeping a few of those tiny cheese chunks in the butter contributes to a nice texture. Scoop the mixture onto some plastic wrap on a flat surface. 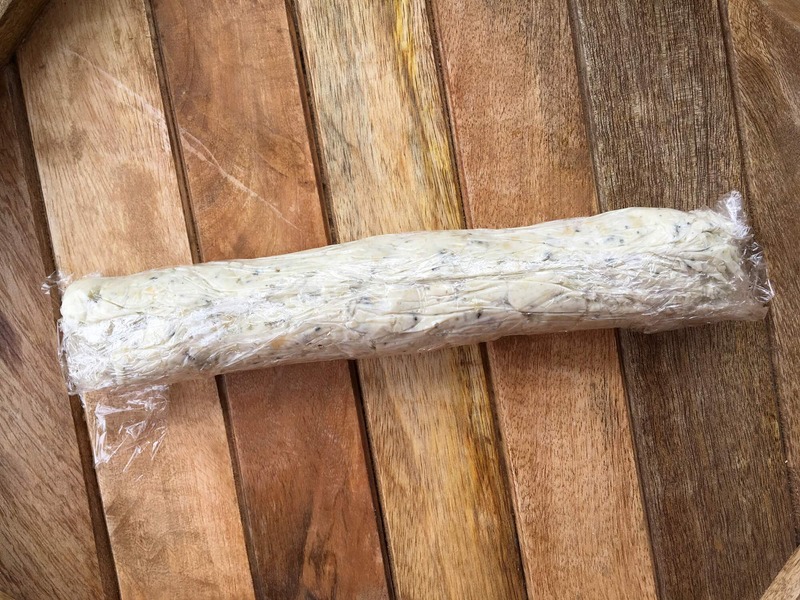 Roll it up in the plastic wrap, pressing and forming it into a log. Chill for at least a couple of hours before serving. 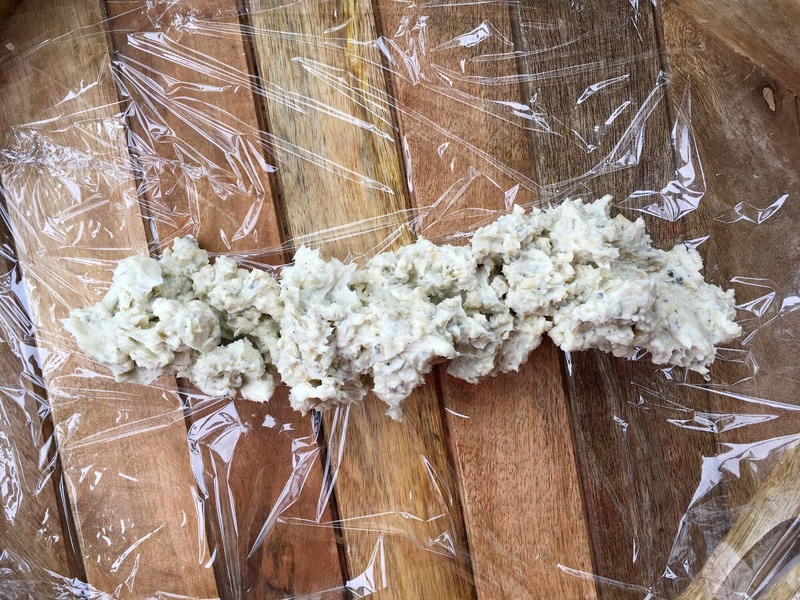 This will keep in the fridge for the life of the blue cheese or can be frozen. 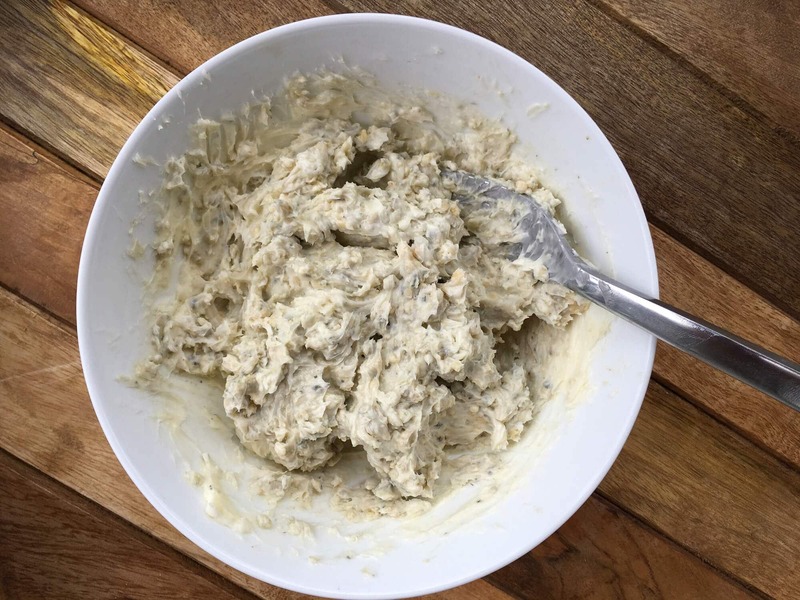 Place the butter and blue cheese in a bowl and mash with a fork until thoroughly combined. Some tiny chunks of blue cheese is great for texture. Scoop the mixture onto some plastic wrap on a flat surface. 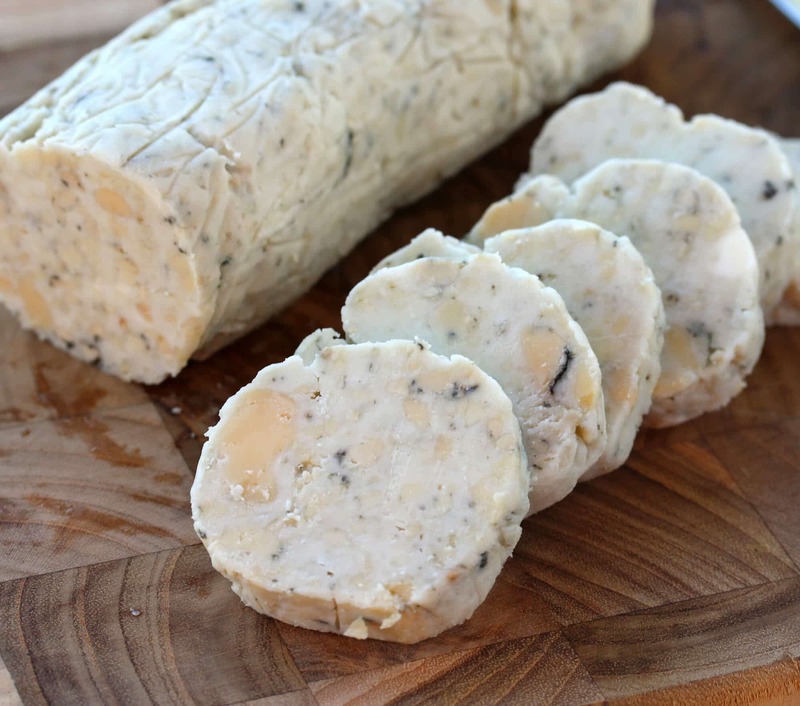 Roll up the blue cheese butter in the plastic wrap, pressing and forming it into a log. Chill for at least a couple of hours before serving. This will keep in the fridge for the life of the blue cheese (check the expiration date) or can be frozen. Compound butter is such a good way to add so much more flavor! I wasn’t a big fan of blue cheese when I was a kid, either, but now I’m totally obsessed with the stuff. I especially love it on salads, but pretty much any excuse to add some blue cheese to a dish is fine by me. Love the idea of putting it on steak… that sounds heavenly! I love blue cheese as well, but never had in this combination. I love the way the butter melts on that steak. I used to hate blue cheese too! I grew to love it as an adult! I can’t wait to make this to put over some steaks! 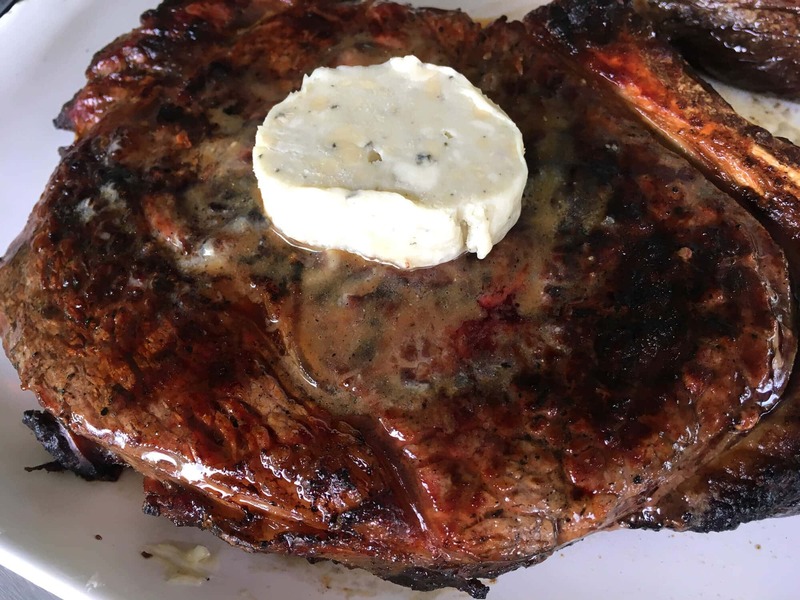 We love butter over steaks like this. 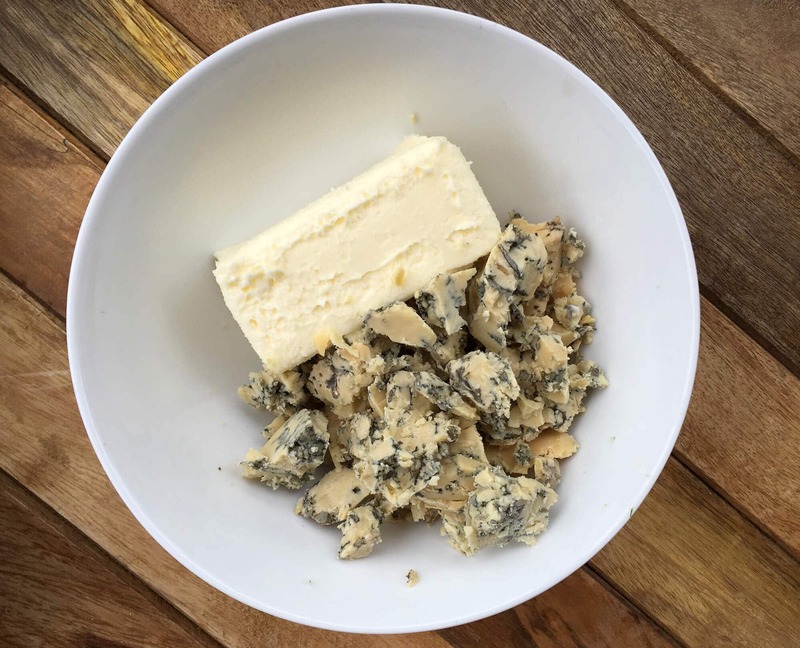 I always seem to have some leftover blue cheese and I think making some blue cheese butter and keeping it in the freezer is a great idea :) Thank you so much for this recipe! I love blue cheese and so do all of my kids! I can’t wait to see their faces when I show them this! I LOVE making compound butters, and I have some steaks that will be perfect with this! I’m so in love with this….I would put it on ALL THE BREAD!!! This would make such a nice homemade gift too! This sounds simply wonderful.I can’t wait to try it on steak or a roll. Think I will make smaller logs so they will accommodate 2-4 steaks. What a super idea,thank you. I am just so mad at myself for not thinking of this. Wonderful! Can’t wait to get some Blue Cheese to make these rolls. Blue Cheese doesn’t last long in our house, we love it. Thankyou for this inspiration. I will be using clarified butter for this recipe…looking forward to consuming!